Five Reasons Why the Warriors Will Win the Title, and Five They Won't. It's all about depth, defense, three-point shooting, youth, and the San Antonio Spurs. 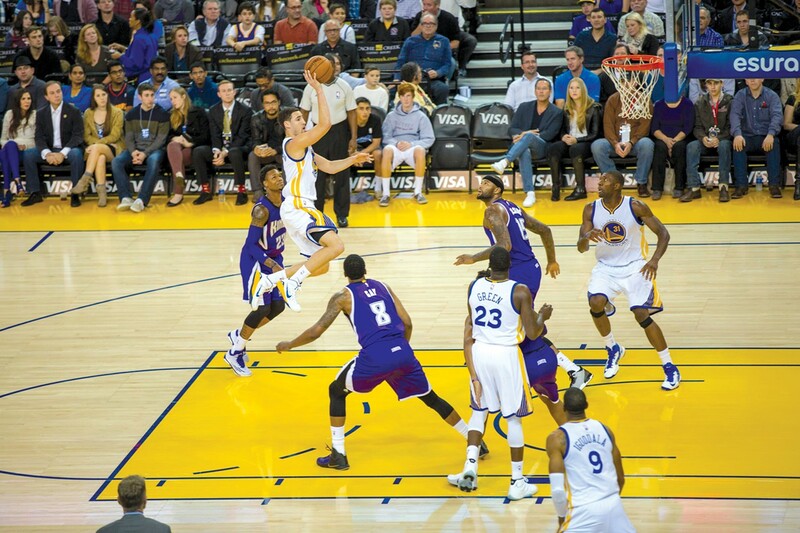 Many NBA insiders consider Klay Thompson the best two-way two guard in the game. When a team is historically good, it leads to a certain type of conversation that hasn't happened around Oakland. Like the one comparing the 1995–96 Chicago Bulls to the 2014–15 Golden State Warriors. But then-Bulls player and current Warriors Head Coach Steve Kerr is having none of it. "That's blasphemy," he said. Forgive the sacrilege, coach. That's the way things go when you haven't been part of the conversation, or even within earshot. But maybe it isn't such a serious sin. After all, at one point this year, Golden State approached the highest per game point differential ever. The Warriors also frequently outdo the sheer speed, generosity, and joy of another all-time best team, the Showtime Los Angeles Lakers. And they lead the National Basketball Association in field goal percentage and defensive FG percentage, something the 95–96 Bulls did not. Still, no comparison will be valid without a championship. Here's why Warriors, as their record-setting regular season ends on April 15, will take one. And why they won't. 1. Depth. It's a good thing when you can bring three All-Star caliber players off the bench, including Andre Iguodala, David Lee, and Marreese Speights, the latter of whom was the Best Sixth Man for the first half of the season. Long, talented reserves like Shaun Livingston and Justin Holiday can score and share the ball, allowing the Dubs to fill the floor with athletic defenders who can swap on each screen, and helping defensive coach Ron Adam's switching "shell" D confound opponents. At one point in the first half of the season, the Warriors' first and second five both ranked at the top of efficiency in the league. And the most impressive thing about the 36-points-per-game reserves is their professionalism. When there weren't many minutes in the rotation for proven scorers like Lee and Leandro Barbosa, they're still the first to leap off the bench after a good play or before a time out. When the Warriors earned their fifteenth straight home win in January, everyone who played had an assist. That is chemistry rarer than the atypical depth, which reinforces how unselfish the entire team — averaging a league-best 27.4 assists — really is. 2. Defense. Yes, the team owns the most explosive offense on the continent, and by a substantial margin (scoring 109.7 points per game versus the next best at 106). But the Warriors also lead the league in point differential (10.2 points per game as of last week). 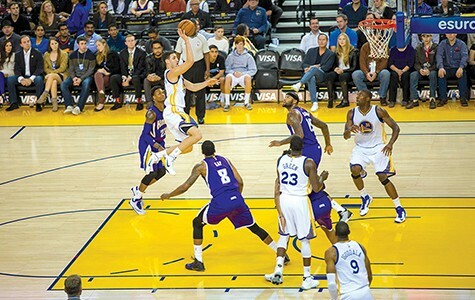 Defensive leader Andrew Bogut ranks near the top in blocks despite sitting out about 23 minutes a game. Along with fellow All-NBA Defensive Team contender Draymond Green, they rank second and fourth in defensive efficiency per one hundred possessions. Iguodala earned first team defense status a year ago. Meanwhile many NBA insiders consider Klay Thompson the best two-way two guard in the game. Curry's two steals a game are fourth in the NBA. 3. Three-point Shooting. By the time a normal shooter releases the ball, Stephen Curry's is already 12 feet up in the air, as ESPN's Sports Science demonstrated. His 0.33 second trigger ranks as the fastest ever measured, to go with his record for most threes in a season this year, which broke his own record. Quickness is a quality that translates to the W's comebackability, as they showed returning to win after down 26 (to the Boston Celtics) and 20 (to the Dallas Mavericks). The team makes an average of ten threes a game; Thompson made nine in one quarter versus the Sacramento Kings in January. And with Harrison Barnes stroking it from outside, they have three shooters firing at 40 percent or better. "When you have that threat [from 3] you're always in the game," says W's analyst Gary St. Jean. "You can score twelve in a minute and a half. I don't know what it's like for the other team, but it's good for us." 4. Youth. Young legs plus lots of strategic rest from Kerr equals explosiveness. There is a fresh hunger here demonstrated most dramatically by third-year and Most Improved Player candidate Green (25 years old) and fellow MIP Thompson (also 25). A fearlessness reverberates with it as well: From Barnes (22) and his late-game heroics on the heels of a hellish night versus Phoenix April 3 — when he had two defensive breakdowns and just two points, but then pushed in a tough layup with less than a second to go — they're not afraid to take or make a big shot. A year ago, they lost a painful number of excruciating close games. This year, led by baby-faced undertaker Curry (26), they buried teams in the third and fourth alike. Two other young guns don't appear on the Oracle court. Bob Myers remains one of the youngest-yet-most-savvy decision-making GMs in the NBA (at 39), and the true fountain of youth (and depth) is the Santa Cruz Warriors, who are contending for the NBA D-League title as this story goes to press, while grooming the next generation of players, coaches, and administrators. 5. San Antonio Spurs. Steve Kerr is friendlier, funnier, and cooler than Spurs coach Greg Popovich. But don't mistake his approachability for weakness. He learned every single lesson Popovich taught him as a two-time world champ, and he built those upon a Phil Jackson- and Lute Olsen-forged foundation. Five-time NBA champ Kerr knows the importance of humility, of humor, of quality assistants, of constant communication, of prioritizing things besides basketball. One key playoff lesson he's mastered is a Pop postulate: Give everybody minutes during the season because one of them will win you a playoff game. With weapons like Holliday, Speights, and Barbosa already winning games, that bodes well. "[The Spurs] have what the Warriors want," announcer Bob Fitzgerald said in San Antonio this month. "They are finally equipped to take it from them." They also have an unprecedented piece of equipment: home court advantage, where the W's clobbered the Spurs a month ago. Kerr's ability to scheme on the level with his old coaches, something former coach Mark Jackson struggled with, marks the team's biggest playoff improvement. 1. Depth. For all the admirable scoring and defense that springs from the Warrior pine, they remain most shallow at their most vital defensive spot: center. Bogut is the crux of a team that can defend in the half court, and a nifty distributor and calming influence on the other end. But until Festus Ezeli evolves into a healthier and more astute backup, Speights and Green will be asked to do more on D than is sustainable in the rough-and-tumble playoffs against the Spurs or the Memphis Grizzlies. In a recent — and rare —second-straight loss to potential playoff competitor New Orleans Pelicans, in which Bogut had seven blocks, many blamed bad calls for the Dubs' defeat. The real culprit: Bogut's foul trouble, followed by an Anthony Davis scoring streak from which the Warriors never recovered. They give up six more points per 100 possessions without Bogut. Speights offers condolences: "I can't block as many shots as [Bogut], but I can take some charges." Only no one says "Charges win championships." 2. Defense. Gaping holes were revealed by the Spurs in the last throes of the regular season, when Kawhi Leonard outscored Harrison Barnes 18-0 at one point and 26-4 overall, even though Leonard only played 24 minutes (to Barnes' 28). A game earlier, Barnes and the boys committed 37 fouls against the Mavericks, or roughly a foul every time Mavs owner Mark Cuban made a funny face. In the tough Pelicans loss they gave up more than 100 points (103), something they do with alarming frequency. 3. Three-point shooting. This could also be called the Klay quotient. His burps in productivity grind the offense to frustration. It's no coincidence that the team's recent consecutive losses occurred when Thompson totaled just thirteen points. TNT analyst Charles Barkley has made this his mantra, but his favorite cliché does carry weight: You live by the jumper, you die by the jumper. They have attempted more than 27 threes per game this year. 4. Youth. This group has never been to an NBA finals, let alone a Western Conference finals. The longest tenured Warrior is Curry, who has experienced the playoffs twice but the second round only once, when they were eliminated by the Spurs in six games. After that series, Curry had this: "We can build on this for next year. ... When you play a team like the Spurs you [see] how much attention to detail and mental toughness it takes to grind it out." But a season later they went home after the first round. 5. The Spurs. The road to the Finals goes through defending champs, the only Western Conference team to deal the Warriors a home loss all year. After the late season loss to the Spurs, Kerr acknowledged, "They're doing what championship teams do: Make it through, peak at the right time. That's the whole point. We gotta learn from this. This is a team that has some rings. There's another level to get to. It's one thing to win a lot of games, and another thing to win against a championship team. We gotta get better." Correction: The original version of this story misspelled Andrew Bogut's first name. Contact the author of this piece, send a letter to the editor, like us on Facebook, or follow us on Twitter. Responding to gentrification and the political climate, artists are creating work reflecting an increasing urgency to preserve the local legacy of Black culture. At 7 Stars Holistic Healing Center in Richmond, it's all about educating customers. The planning department's failure to update city rules could let hoteliers who committed wage theft to expand in Oakland. Less parking, and more accommodation of bikes and pedestrians, also expected from planning process. Following November's election, 4-1 progressive majority has big goals. Green Law Clears Grey Area: Can Cannabis Stores Thrive in Alameda? Following months of largely procedural wrangling, the council has approved a plan to allow four dispensaries on the island. After winning the championship, the Dubs set a record for wins to start a season — despite losing their coaching guru. Meanwhile, Oakland council holds off on tax increase and pioneering San Leandro mayor dies. Hayward councilmember and state senator among likely contestants. Plus Eric Swalwell will run on gun control, and Nancy Skinner chews out Xavier Beccera. As with teachers, wages for the city’s employees are falling behind. But the Trump Administration would have it another way. A guide to this holiday season's gifts, outings, eats, and more.